Many people accuse us Catholics of putting Mary ahead of Jesus. Which is silliness! Jesus is clearly the one who gets the highest place of honor, and anybody walking in our church clearly sees this, as there are images of Jesus everywhere! But, boy! We sure do love our Mother Mary! With that said, today, September 12, is the celebration of the Most Holy Name of Mary! Mind you, we have a feast day of the Most Holy Name of Jesus (January 3), but this is a special day regardless because it marks a huge historic military victory that has defined Western Civilization ever since it took place. 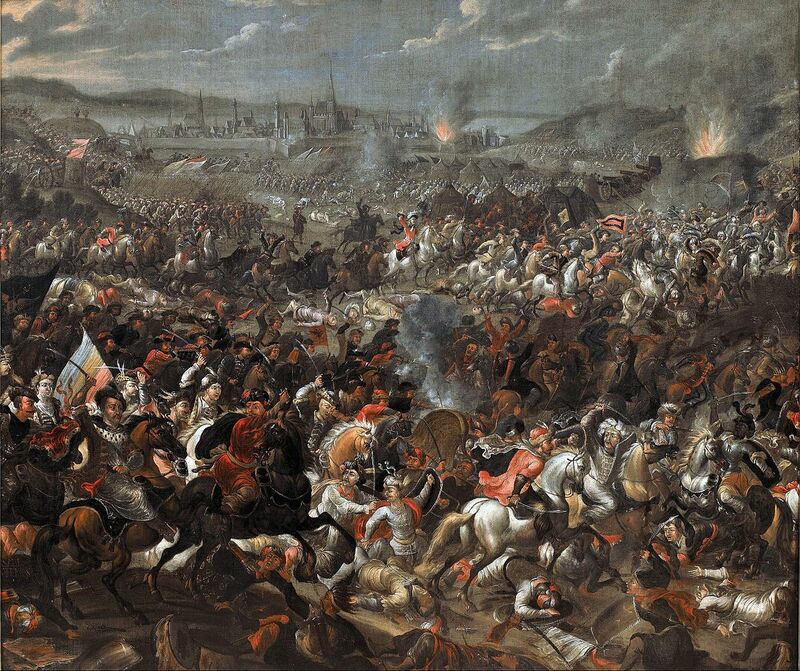 Battle of Vienna, by Pauwel Casteels, c. 1683-85. Museum of King Jan III’s Palace at Wilanów, Warsaw, Poland. See, in 1683, there were an estimated 300,000 Islamic soldiers from the Ottoman Empire that lay siege on Vienna. After two months of being under siege, it looked very likely that Vienna, which was a huge military asset due to its position of being the gateway to the west, was going to be overrun by the Turks. And once Vienna fell, it looked very likely that all of the West would fall. Furthermore, to make matters more complicated, the Reformation had just taken place, which shattered many of the old alliances that had once held together Europe. Many of the Protestant countries were complicity siding with the Turks, because of that old adage, “The enemy of my enemy is my friend.” That meant that the Holy Roman Empire, which was the United Nations before the United Nations was a glimmer in anybody’s eye, was weakened considerably and was barely holding onto Vienna, with all the forces that they had. They needed allies, and they needed allies quickly. So, when the Crown of Poland’s army — which was not part of the Holy Roman Empire and was actually part of Polish–Lithuanian Commonwealth — stepped up and agreed to help, suddenly everything looked a little bit less hopeless. John Sobieski, the king of Poland, entrusted his army and himself to the Blessed Virgin Mary. Starting his military march after he and his army visited Our Lady of Czestochowa, the icon that is featured here, he and his army marched into battle on September 12, 1683. And they won the battle. This was the turning point of the war, which finally ended in 1699, in which “the Ottoman Turks ceased to be a menace to the Christian world” (Leitsch, Walter. 1683: The Siege of Vienna). In fact, so decisive was this victory that there was some speculation that the date of September 11, 2001 was chosen as a throwback to this battle. 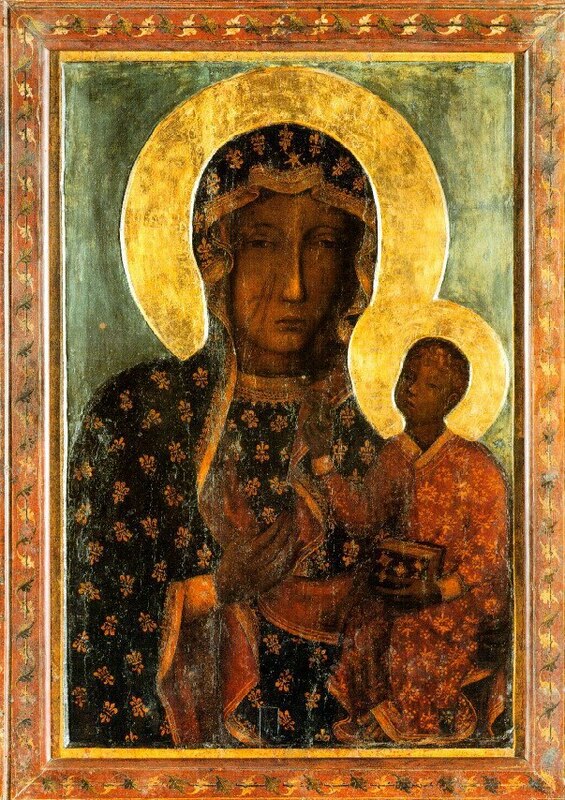 Our Lady of Częstochowa, c. 14th century(? ), Jasna Gorna Monastery, Częstochowa, Poland. The icon, Our Lady of Czestochowa, has an interesting story of its own and many legends and stories surround it. The icon has several scars to her face, allegedly from Hussite raiders who came and looted the monastery. It was said that they tried to steal this icon, but when they put it into their cart, the horses refused to move until the raiders threw the icon out, slashing Our Lady’s face. But when they tried to slash it a third time, the raider dropped dead. The icon is also said to have miraculously saved the monastery from Swedish invasion, which prompted the king at the time to crown her as Queen of Poland. So, the icon is commonly adorned with jewels! Artists throughout the ages have attempted to repair the painting and fix the scars on her face, but the attempts were unsuccessful, likely because the paint was made of an odd wax that was not easily repaired. So, scarred she has remained! But, oh man. I love that fierce look on her face, along with those battle scars. She is an appropriate lady to ride out to war with! So if you’re wondering why this is a special day to celebrate… it’s because Western Civilization is worth celebrating. Anyway, because it is the celebration of the Most Holy Name of Mary, a litany of the Blessed Virgin Mary seemed appropriate! So, with no further ado… here is the litany! ← Happy Birthday, Mother Mary!